BOOK YOUR LAKE GARCIA TRIP NOW! The Lake Garcia Reservoir is a 3,149-acre lake along the east coast of central Florida. Facilities at the reservoir include a double lane concrete boat ramp, parking lot, picnic pavilion and restroom. 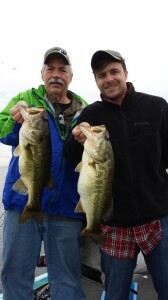 There are good numbers of largemouth bass and produces its share of trophy bass each year. Largemouth, bluegill and black crappie are also present here. Anglers have many great Florida fishing spots to choose from, from the grass and cypress trees along the lake’s perimeter to the deepwater in the middle of the lake, to Big M and Zigzag Canals (Big M Canal and Zigzag Canal hold a decent amount of panfish). There are numerous other hotspots, like the shell bars just offshore, or around the vegetation in the deepest water (which are suitable hard bottom for spawning). Click below on the region of the map you wish to find a fishing guide - Below find the Fishing Guides for the Okeechobee Region!